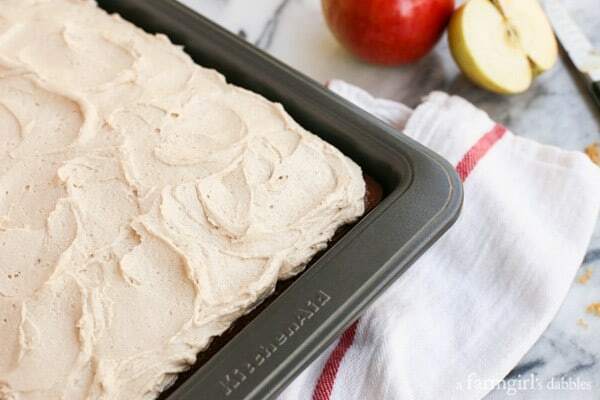 To take this Apple Cake with Fluffy Brown Sugar Buttercream from dessert category to breakfast, simply eliminate the frosting! I just got off the phone with our local apple orchard, inquiring when their Haralsons will be ready for picking. Each year I do this, no fail. There’s always such a small window of opportunity to pick this apple variety with our own hands, and I simply can’t stand the thought of missing out. It’s our Fall tradition. This Apple Cake with Fluffy Brown Sugar Buttercream was created with apples available earlier in the season than my beloved Haralsons, but you can bet I’ll be making this again when we get our hands on some of those crisp, tart beauties. 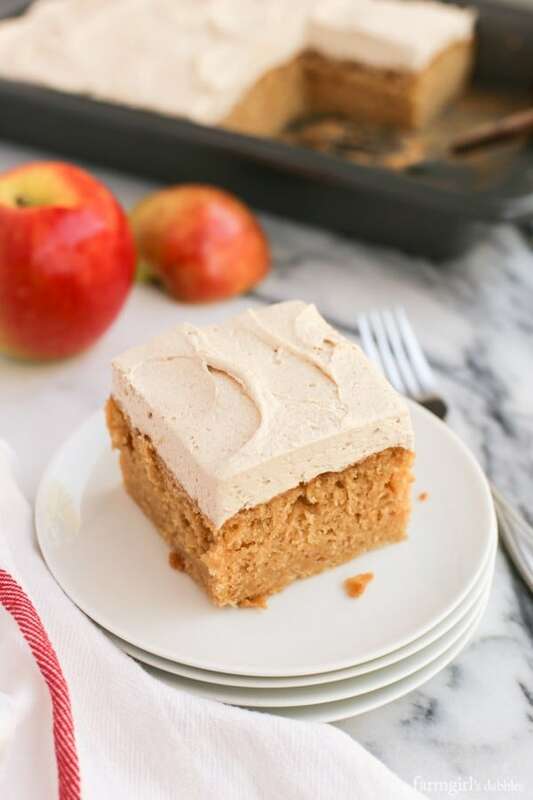 Because this apple-rich cake, slathered with a sweet and fluffy-fun buttercream frosting, is Fall baking perfection in a 9″ x 13″ pan! 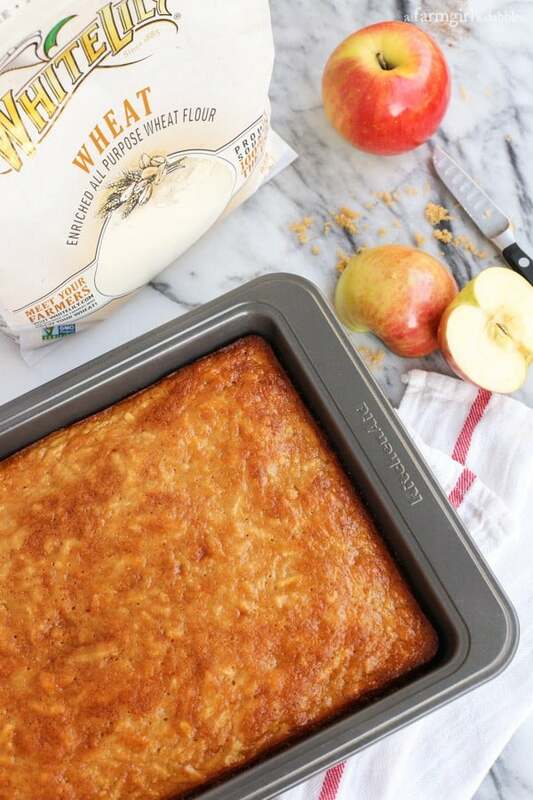 This year, I have been honored to partner with White Lily, to share with you about their new line of premium flour blends. I joined White Lily for the first time a couple years ago for their Southern Baking Retreat in Nashville, Tennessee, where I got schooled in the art of Southern biscuit making. I had never used this Southern flour brand before and had such a great time making biscuits with them! And then this past spring, I traveled to Spokane, Washington to learn about White Lily’s new line of premium flours (read all about my experience here). Two of their blends incorporate grape seeds, lending unique textures and flavors to baked goods – check out my Dark Cherry Scones with Chocolate-Chili Glaze to see the red grape seed flour blend in action. And the other flour introduced out in Spokane was the enriched all purpose wheat, which I used here in this apple cake recipe. All of these flours can be traced back to the farmers who grew the wheat by simply inputting a code from the flour bag into the White Lily website. Apple season is very much a celebrated time of year at our house, and our frequent apple projects in the kitchen are solid proof. From my mom’s awesome quick bread recipe (the inspiration behind this new apple cake recipe), to cookies, pancakes, overnight baked oatmeal, muffins, and so much more, we are apple lovers through and through. This cake is packed with apple flavor and is beautifully moist, with shredded apples and applesauce stirred into the batter. Because my favorite Haralsons weren’t yet available, I used two other Minnesota-born apple varieties, the Zestar and SweeTango. For more depth of flavor when baking with apples, I always try to use more than one variety of apples in a recipe. And then I whipped up the most wonderful frosting, warmly spiced with cinnamon, to slather over the top of the apple cake. I call it my fluffy brown sugar buttercream. The extra whipping time, plus powdered sugar, make the buttercream luxuriously fluffy. But the really, really fun part is the brown sugar. Its larger granules are flecked throughout, giving this frosting crunchy little bites of yumminess. Trust me, the crunchies are fun! The thick layer of fluffy brown sugar buttercream definitely places this cake in the dessert category. 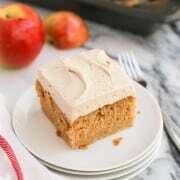 But if you’re looking for a great breakfast cake, where Fall’s apple goodness shines brightly, just eliminate the frosting. Or maybe just frost half the cake. Because, geez, I’d hate for you to miss out on that awesome buttercream experience! Preheat oven to 350°. Lightly spray a 9″ x 13″ pan and set aside. In a medium bowl, stir together the shredded apple with lemon juice and 1/4 cup of the white sugar. Set aside. In another medium bowl, whisk together the flour, baking powder, cinnamon, mace, nutmeg, and salt. Set aside. 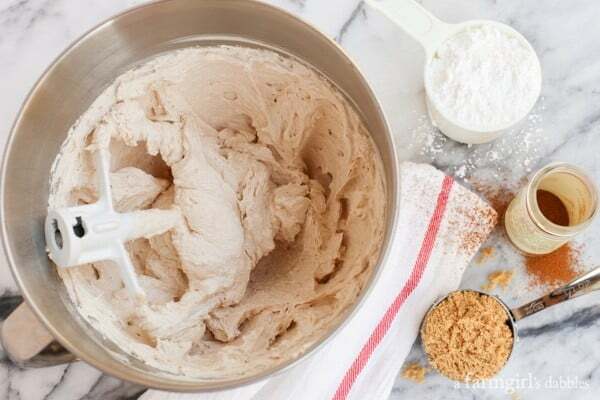 In the bowl of a stand mixer, combine the remaining 3/4 cup of white sugar, brown sugar, oil, applesauce, eggs, and vanilla. Mix to combine. Then add the flour mixture and combine once again. Add the apples and mix until the apples are evenly distributed. Pour into prepared pan and bake for about 50 minutes, or until the cake is nicely browned and a toothpick comes out of the cake clean. Let cake cool on a rack. In the bowl of a stand mixer fitted with a paddle attachment, whip butter on medium-high speed until very fluffy, about 8 minutes, occasionally scraping down the sides and bottom of the bowl. Add powdered sugar, brown sugar, cinnamon, and salt, and beat on low to incorporate. Add half and half and vanilla extract, mixing on low until combined. Increase mixer speed to medium-high and beat until very light and fluffy, about 5 to 6 minutes, occasionally scraping down the sides and bottom of the bowl. Disclaimer: I am honored to partner with White Lily to share about their new line of premium flour blends. This post is sponsored by White Lily. Thank you for supporting a farmgirl’s dabbles and the brands we so carefully choose to work with. All opinions expressed are our own.